mellicious | Oh look, it's a quilt! What a gorgeous quilt! I love the combination of purple and green. I have a ring featuring amethysts and emeralds. I need to find that and wear it some more! What color is the reverse side of the quilt? I can't tell from the picture, but does it have a black border? I've only ever made one patchwork quilt, with scraps from all the fabrics my mother used over the years to make clothing for herself, my brother and me. I made rows and rows of squares, then sewed them together on the sewing machine. I used a flannel backing and "quilted" the batting inside with long diagonal rows of stitches, also machine-done. It would never have occurred to me to use more scraps for the back. I've never been to a quilt show, so I was pretty much flying blind. My mom appreciated the effort, and we sat on the floor together and identified all the different fabrics and what she had made with them. My hand-sewing skills are pretty crummy, but the sewing machine did the trick. I'll use your idea of big blocks of whatever I have leftover to make the reverse side of my next quilt, whenever that may be. And I'll try to attend a show. That will either motivate me or discourage me entirely from making another quilt. I started going to shows with my mom long before I ever made a quilt. I think it did serve as an education of sorts - I'd sit there and puzzle out how things were put together and stuff like that. I did go poke around and look for pictures of my quilt backs, and I found a few. 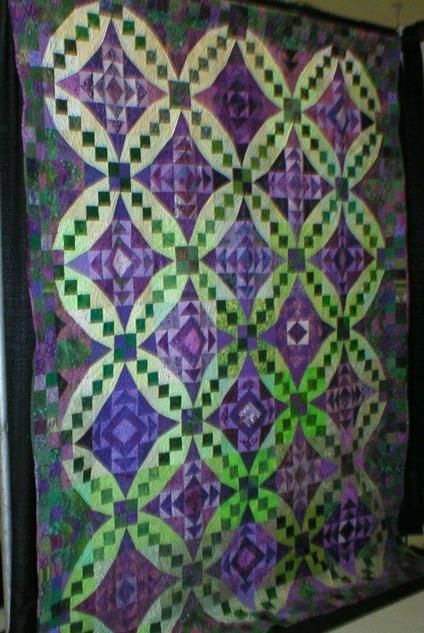 Not the purple one, but then I do have this quilt nearby so I can try to get a decent picture of that. I haven't made a quilt in a while, myself, but I still like talking about this stuff.